Professional attire color does indeed have an impact on productivity. The impact of color on mood has long been known and the same ideas that affect color choices in hospitals and restaurants can be used to advantage in the workplace. When choosing professional attire, pay attention to colors and patterns to improve productivity in the office. Professional attire is normally dark toned, but avoid choosing black when selecting a suit. Grays, blues and dark browns will achieve the same professional note without the dampening effect that black can have on mood in the workplace. Add pastel shirts and ties to give a splash of color as well as a mood-lifting focal point. In high stress environments, blues and greens are subtly soothing and may help keep the wearer calm and focused. Women in the workplace need to pay special attention to color when selecting attire. Red is considered a power color, but can be overdone when impacting productivity is the goal. Save the full red outfit for meetings and conferences instead choosing a red jacket over a gray skirt, for example, when in the office. Bright colors mixed with more somber grays project confidence, while pastels on a woman are seen as feminizing. Many times advising subordinates in the workplace to dress uniformly can be difficult. Choose darker slacks with a neutral-toned top. This is often a situation in restaurants. One particular establishment went through a corporate change that eliminated the personalization and customers grumbled that they couldn’t always figure out who their waiter was. Allow workers to add personalized touches with scarves, ties, headbands or other small additions. Worker satisfaction is as important as a uniform look when large numbers of people work together. Some curtailing of fashion choices may be necessary if the added “flair” impacts safety or is distracting to coworkers. 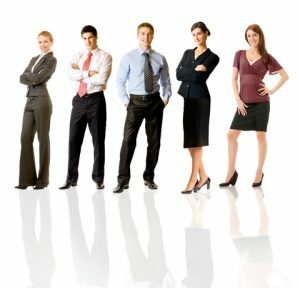 Personalizing your professional attire does not mean that you need to be ‘uniform’. As long as you remember to consider your industry and what is considered acceptable, you can still find ways to wear a signature style. Business owners and managers are well advised to listen to their customer comments so their experiences are positive and will lead to great referrals.